Recently the Civil War Trust announced an effort to preserve land related to the June 1, 1864 fighting at Cold Harbor. This combat has often been overshadowed by the Union assault which took place there on June 3. Cold Harbor had yet to become, in the words of Union staff officer Thomas Hyde, “the Golgotha of American history.” When I read through the announcement and examined the map which included the targeted tracts my eyes were immediately drawn to a particular segment of the property. It lays just north of the Cold Harbor Road and above and slightly to the right of the Miles Garthwright House. On May 30, with Union cavalry operations heating up around Cold Harbor, Gen. Robert E. Lee began shuffling men there to secure the area. This effort continued the following day, as the Federal cavalry attacked and eventually captured the road junction. Late in the evening of the thirty-first, Lt. Gen. Ulysses S. Grant and Maj. Gen. George Meade also began to funnel infantry toward Cold Harbor. The crossroads was vitally important to the commanders. One road led directly to the Union supply base on the Pamunkey River while another ran directly to the Confederate capital at Richmond, less than a dozen miles to the southwest. Grant planned to attack there the next morning. The General-in-Chief, however, was asking too much of his soldiers. Walking over the battlefield at Cold Harbor, one of the things that comes to mind is the condition of the men in both armies who fought there. The Army of the Potomac and the Army of Northern Virginia had been locked in a desperate, non-stop campaign for nearly a month. They were completely exhausted. Grant’s expectation to immediately launch an assault following a harrowing night march was unrealistic. The first blue infantry to reach Cold Harbor was Maj. Gen. Horatio Wright’s VI Corps, which tramped in at about 10 a.m. It was not until 2:30 that afternoon that Wright’s last division arrived and deploy for battle. Wright was to coordinate the offensive with Maj. Gen. William “Baldy” Smith’s XVIII Corps, recently arrived from the Army of the James. Smith’s orders had been botched, adding miles and hours to his march. His men finally arrived around mid-afternoon. The delay gave Wright’s men time to wait and contemplate the inevitable assault. Across the open space before them stood Brig. Gen. Robert Hoke’s division and Maj. Gen. Richard Anderson’s First Corps. The Confederates had spent much of the morning preparing and improving their defenses. 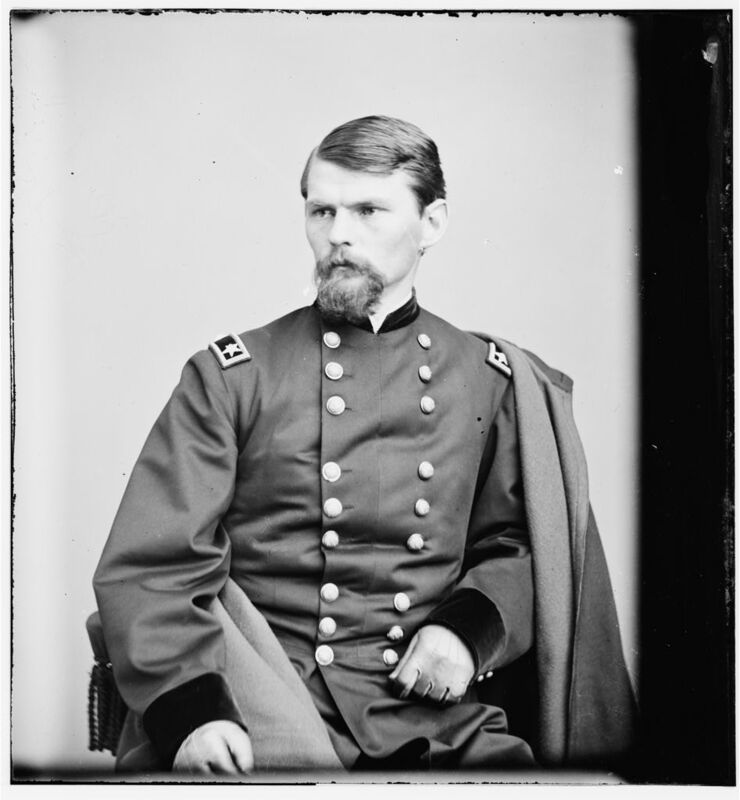 Among those who waited anxiously to make the assault was a brigade commanded by a colonel from New York, Emory Upton. A post war photo of Emory Upton. Courtesy of the Library of Congress. I’ve always been fascinated by Upton. Socially awkward but incredibly brilliant, he was the Sheldon Cooper of his day. Upton had been one of the few men to recognize that the technology of the 1860s, especially the rifled musket and the advent of field fortifications, had rendered the tactics of the day obsolete. Just weeks earlier, Upton led an attack on the Mule Shoe Salient at Spotsylvania. He massed his twelve regiments in a column, three across and four deep. His men were directed not to open fire as they stormed the enemy works. The bayonet assault was initially successful, however, supporting troops did not arrive in time to exploit the breach. Impressed with the effort, Grant utilized Upton’s methods and sent the II Corps crashing into the salient on May 12. Once again, the attack was not properly coordinated which allowed the Confederates to recapture and hold part of the line. As time ticked away that afternoon, Upton prepared for the assault. He formed his regiments into two lines. The 2nd Connecticut Heavy Artillery formed the first, with battalions stacked upon one another. Behind them was the 5th Maine, 95th Pennsylvania, 96th Pennsylvania and part of the 121st New York. The 2nd Connecticut, led by Col. Elisha Kellogg, was a new regiment which had spent much of the war in the Washington defenses. Due to losses sustained in the campaign, they were converted to infantry and sent south, arriving with the army on May 21. I wonder what it was like for those men, who had never seen combat, to prepare for the attack. What thoughts went through their minds? What feelings did they have? One thing, I think, was certain. Derisively viewed for their lack of experience by their sister regiments, whose own ranks had been depleted by casualties, the Nutmeggers wanted to prove they were up to the task which awaited them. Upton likely planned for his lines to move forward in concert. The “Heavies” were to carry the brunt of the assault while the remaining regiments awaited the outcome. If they were successful, Upton would send his second line forward to exploit the breach. Should Kellogg meet stiff resistance, Upon would send individual regiments from the second line forward with the expectation that the additional weight would break the Confederate position. Although Upton’s attack had ground to a halt, on his right, Union infantry overran part of Clingman’s line. Upton quickly pushed elements from the 2nd Connecticut to his right and over the works. He then shifted to the left and managed to capture that portion of the entrenchments from which the Confederates had so badly mauled his men only minutes before. Later on, he pressed his second line up to hold against enemy counterattacks. Elsewhere, other units from the VI and XVIII Corps achieved similar results. This temporary success prompted Grant to launch his famous army wide assault on June 3. 2nd Connecticut Heavy Artillery Monument at Cold Harbor. 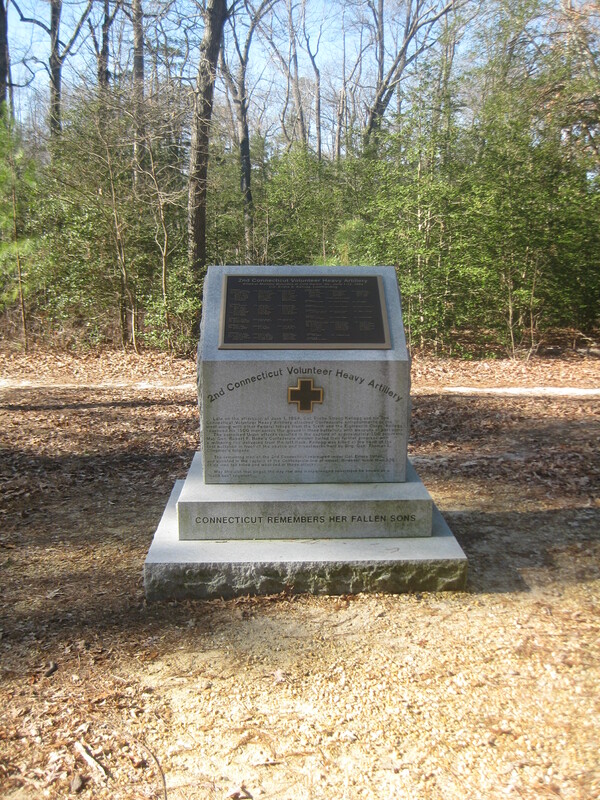 Today, a monument stands within the National Park Service boundary to the 2nd Connecticut Heavy Artillery. Some of the ground over which the regiment traversed during their attack has been identified by the Trust for this purchase. It represents an opportunity to further pay tribute to the valor of Upton, Kellogg, the men who followed them and the other soldiers who fought at Cold Harbor that share in our American experience. This entry was posted in Armies, Battlefields & Historic Places, Battles, Campaigns, Common Soldier, Leadership--Federal, Memory, Personalities, Preservation and tagged 121st New York, 2nd Connecticut Heavy Artillery, 51st North Carolina, 5th Maine, 95th Pennsylvania, 96th Pennsylvania, Army of Northern Virginia, Army of the Potomac, Battle of Cold Harbor, Battle of Spotsylvania, Elisha Kellogg, Emory Upton, Horatio Wright, Mule Shoe Salient, Richard Anderson, Robert E. Lee, Robert Hoke, Thomas Clingman, Ulysses S. Grant, William "Baldy" Smith, XVIII Corps. Bookmark the permalink.